SuperPatriot is briefed by the flight crew on where Jake Farrell has cleared them a place to land but the conversation is ended when the Covenant of the Sword are spotted outside their aircraft. The pilots are killed with gunfire and SuperPatriot races to gather his kids, forcing them to jump outside. They begin to plummet down towards the ground without any parachutes to save them. Liberty starts complaining but her father uses her to push off of and begins to carry out a plan. The cybernetic Drei has his sky-sled caught by SuperPatriot’s grappling hook and he pulls himself in before knocking the villain off. Zwei flies back to catch her teammate while SuperPatriot collects Liberty and a screaming Justice in mid-air. The heroes then attempt to flee from their assailants but end up getting chased through the Tokyo skyline. Their stolen vehicle is damaged and they are forced to leap off whilst still in motion. Drei leaps off of his companion’s sky-sled and attacks Liberty which leaves Zwei to target Justice. He jumps on the back of a motorcycle and has the rider races them away. SuperPatriot is engaged in battle by Ein who demonstrates the upgrades that have been made to their nanotechnology since his enslavement by the Covenant. He merges with anything mechanical in the area and they end up fighting atop a speeding train. Despite being hopelessly outclassed in terms of weaponry by Drei, Liberty refuses to back down against her superior opponent. She ends up using his weapons against him by breaking off a blade which she then stabs through Drei’s head. Justice’s new companion turns around and races back towards their opponent. The motorcycle is eventually struck by Zwei but the rider had planned ahead, leading the villain towards the main battle scene. 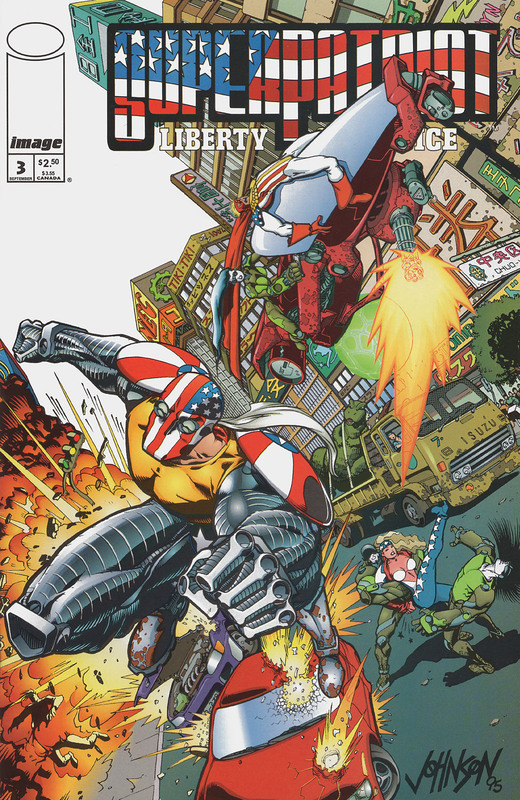 The train had stopped moving due to the fight occurring on top of it and SuperPatriot is kept in check due to Ein sealing several innocents in his nanotechnology. Zwei emerges from the smoke and ends up impacting with Ein which causes a massive explosion. The Covenant cell that had deployed the three operatives realizes that they have failed. Their commander is furious that the Osaka cell is recovering the remains of their agents but is prepared to take responsibility for the whole failed affair.